Jazar Crew, DGTL, Dave Clarke, Nyege Nyege Festival, and Dominic Peters (Goldfish) to speak at ADE’s dedicated one-day conference for sustainability and social progress in the electronic music industry on Wednesday, October 17, in the DeLaMar Theater. During ADE, Amsterdam is the center of the international electronic music scene, attracting over 9,000 influential players and 400,000 festival visitors. ADE Green aims to highlight the latest developments in sustainability and social issues in the music and events industry and use that huge presence to drive change on a large scale. For the sixth year in a row, the conference connects leading thinkers and innovators so that they can share their knowledge and experience through panels, workshops and debates. There are three central themes that ADE Green’s organisers believe define the future of the music and events world. The panel Rave for a Revolution! outlines the role of electronic music as a powerful political tool that unites people from all backgrounds and gives them a voice. Inspiring examples include the massive rave revolution against police brutality in Georgia (Naja Orashvili, nightclub BASSIANI) and a taboo-breaking dance festival in Uganda (Derek Debru, MTN Nyege Nyege Festival), to the musical call for freedom in Palestinian through underground raves with Jazar Crew. In Artists Empowering their Communities to Create Change we feature artists Sam Feldt (NL), Dave Clarke (UK), Vivie-Ann (SP) from Blond:ISH and Tala Mortada (LEB), all of whom use their status as role models to inspire their supporters to engage in social change. The Power of Brands, with Q-Dance (NL) and Wonderfruit (THAI), focuses on the business world asking whether brands should also use their influence for social or sustainable goals, even if this is outside their core business? Unite the World with Music and Pay it Forward tells the story of Shailendra Singh, who provided education to 128.200 under privileged children in India through his foundation Guestlist 4 Good, with the help of artists like Hardwell, Martin Garrix and W&W. Can we call a halt to the massive environmental pollution caused by plastic waste? During The Future of Plastic, Secretary of State for Infrastructure and Water Management Stientje van Veldhoven will be discussing the future of plastic use. Following that, DJ Sam Feldt, together with frontrunners from the event industry (o.a. AB InBev, ADE, AIR Events, Coca-Cola, DGTL, Grolsch, Heineken, ID&T, Lipton en Vrumona) will be launching an initiative that drastically reduces plastic use. In Cup, Cup, Cup from Waste to Resource, representatives from Festival Republic (UK), Pukkelpop (BE) and Amsterdam Open Air (NL) will be revealing how they have implemented a more sustainable drinking bottle system. The transport of festival materials, public, artists and crew also creates considerable CO2 emissions, and In The Elephant in the Room: Transport, Tijl Couzy (Lab Vlieland) will be talking about how he found successful solutions for Into The Great Wide Open. Then it’s time to roll up your sleeves and get to work at the Milan Meyberg workshop, How to Design a Green Strategy. Festivals and events simply cannot happen without diesel generators, so how do you fix that? During the interactive Power Rewired session, the five best solutions to make your energy plan sustainable are to be presented and discussed. Disruptive startups will get their moment in Six Innovations That Will Change the Event Industry. Ideas include urinals for women (Liquid Gold / Weestand, SA), mobile composting in 24 hours (Lab Vlieland, NL) and a tent that is biodegradable (Comp-a-tent, GB)? Also featured are SeMiLLa (Peter Scheer, NL), a startup that converts sanitary waste water into clean water and fertilizer, Society in Motion (Hooman Nassimi, IR), which gives festivals a role in the integration of newcomers to the jobs market (Jaime de Zwart, NL), and food designer Chloé Rutzerveld, who combines science, technology and nature in her experimental work, will be taking delegates on a journey to the future of our food. 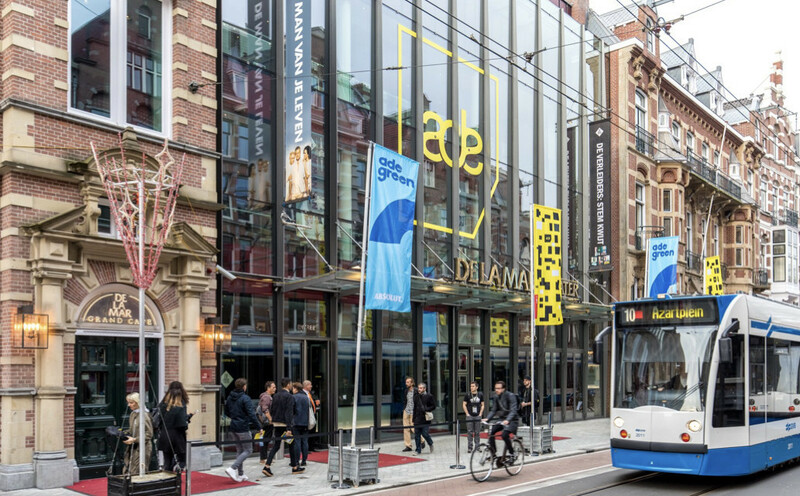 ADE Green will take place on Wednesday, October 17, 2018, from 12:00 to 18:00 at the DeLaMar Theater in Amsterdam. Admission tickets cost €35 and tickets are available here. ADE Green is also accessible to 1- and 5-day ADE conference ticket holders.